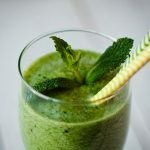 Matcha Mint and Melon Green Smoothie: Great for Weightloss! Matcha, never to be confused with mocha, is a powdered form of green tea. 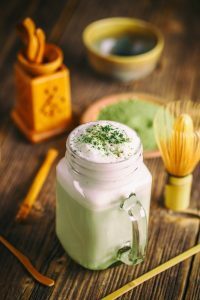 Matcha is a major nutritional heavyweight. A tablespoon of matcha has 137 times the antioxidants of traditionally brewed green tea. Antioxidants are cancer-fighting superheroes, and also have anti-aging benefits. 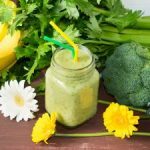 My Matcha Mint and Melon Green Smoothie is a refreshing blend of ingredients to detox and debloat the body. 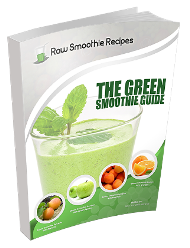 This raw green smoothie is a summer staple for me. Check out what I’ve learned about matcha. Match can aid in weight loss, as it naturally boosts metabolism. This antioxidant rich powder detoxifies the body and calms the mind. It’s known as a therapeutic supplement that soothes and calms the mind; acting as a natural mood stabilizer. It’s rich in vitamin C, selenium, chromium, zinc and magnesium which helps to prevent heart disease and diabetes. Plus, it lowers cholesterol and blood sugar too! 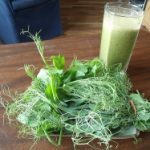 Blend a batch of my Matcha Mint and Melon Green Smoothie recipe. The flavor blend of honeydew melon, mint, and matcha is refreshing. 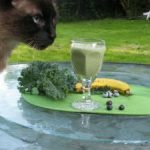 The smell is calming, and this raw green smoothie recipe delivers the relaxation factor of a getaway to a day spa. I prefer to chop the honeydew melon and freeze it for several hours. 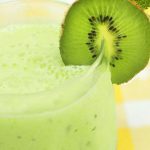 Make this smoothie and keep it chilled in the freezer or refrigerator to let the flavors marry. Sometimes, I prepare my Matcha Mint and Melon Green Smoothie before stretching and yoga. After my workout, I have my raw green smoothie easily accessible in the refrigerator. Plus, the blend of mint, melon, lime, and matcha marry well once blended and cooled. Chop and chill honeydew melon and lime. Slice avocado, then add all ingredients to the blender. Blend for up to two minutes. 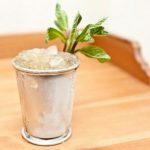 Add more water or ice cubes to reach desired consistency. Hint: if you have an extra stalk of celery or cucumber, add both or either to the recipe. They add flavor and refreshment.